Would you play this as a pure 5-drop? I'm just thinking if adding him corrupts my deck or not. The Curator and Menagerie Warden are great with the tiger, but if the Tiger is bad in its own, then maybe its not worth running over more consistent cards? I am glad this card is finally getting some attention. Back in my early days, he used to be one of my favorites with Hunter and my very cheap tempo mage. My absolute favorite HS card :D. Sad it's usually overshadowed by Belcher, but is actually better than that card in Midrange Hunter. Still holds up as just a solid 5 drop for decks, new players this is a great card to have in your deck until your get some other tech choices. A card that Reynad respects enough to even consider putting in a deck and a card that Trump has been using to much success during his free to play Priest deck for Season 19. Although many other 5 drops (Sludge belcher, Loatheb, etc) can certainly eclipse this card, it can still see play with it's 99% of the time initiation due to its stealth. Overall a strong card in constructed and one of the best 5 drops in arena. Definitely a good pick in the Arena; this card seems like a very solid (and common) pick when drafting some midrange threats. Funny that even though it does not see much play in constructed, the tiger trades well with the popular Sludge Belcher. This is a really solid card for putting pressure on a low-health opponent. No non-combo AOE can remove it and as soon as your opponent doesn't have a taunt it pushes 5 damage into their face. Also it barely sacrifices anything in the way of stats for the stealth effect. I'd say the only issue with it is how crowded the 5-slot is. Very good card! And it's nice in golden! 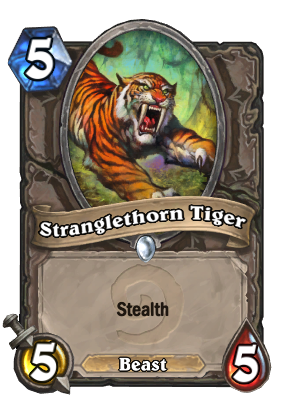 I think Stranglethorn Tiger is one of the best five drops in the game. Their aren't very many good five drops and the only one with arguably better stats is the Druid of the Claw. Azure Drake has good effects with it, but it dies to many four drops. Gadgetzan Auctioneer has one of the best card draw mechanisms in the game but it only works in very specific decks.